Sri D. VENKATESWARLU, B.E. M.B.A All the Principals of Govt. State Board of Technical Education and Telangana, Hyderabad. Director of Technical Education, Telangana, Hyderabad. With reference to the Memo. cited above, the minutes of review meeting are communicated to take up the follow up action immediately to establish Solar lamps, C.C. Cameras and Wi-fi facility in all Government Polytechnics in Telangana State. Further the Principals of Govt. Polytechnics identified to apply for National Board of Accreditation (NBA) are informed to take up establishment of Solar lamps, C.C. Cameras and Wi-fi facility immediately. Upon considering the financial viability it is proposed that the 4th proposal reported by the Committee for Rs. 54,600/- + existing 10mbps broadband internet connection for new Govt. Polytechnic where two branches is proposed. In case of old Govt. Polytechnic without 2nd shift for Rs. 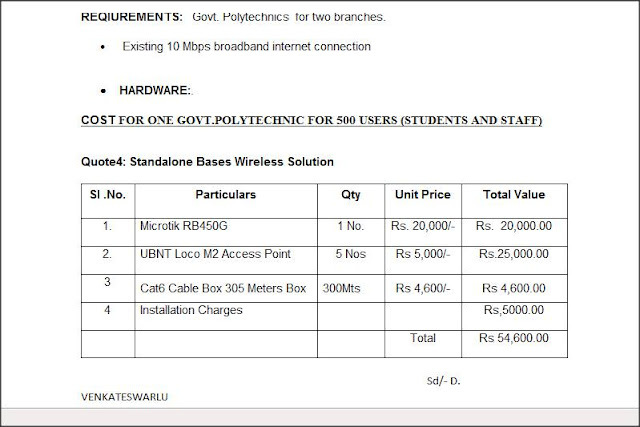 1,09,200/- + existing 10Mbps broadband internet connection is proposed and for two shifts old Govt. Polytechnic for Rs. 2,18,400/- + existing 10Mbps broadband internet connection. The proposed the equipment and probable cost of items to be procured for establishing Wi-fi facility as proposed by the committee is enclosed in the Annexure for necessary guidance. ESTABLISHMENT OF WI-FI FACILITY IN ALL GOVT. As per the conclusion of committee constituted by the SBTET for establishment of Wi-fi facility in all Govt. 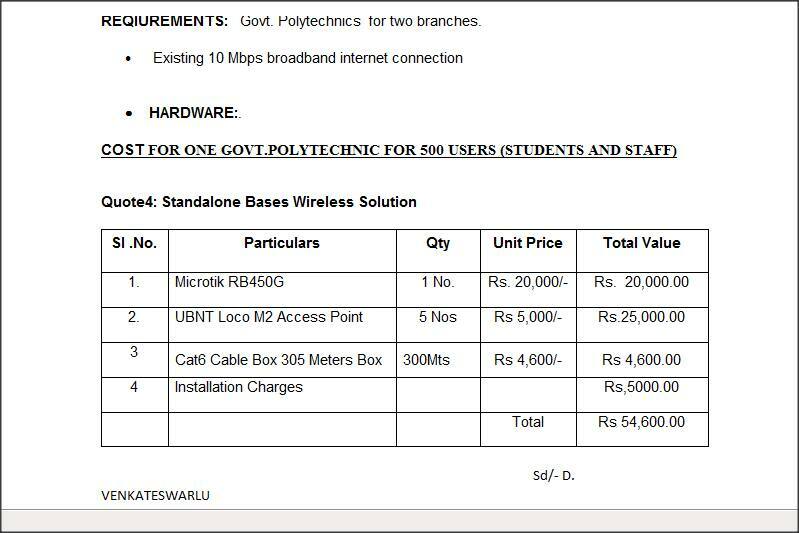 Polytechnics in Telangana State, it is proposed 10Mbps leased line unlimited down and uploaded capacity, Wi-fi facilities need to be provided to access to campus-based Web pages, email, course materials etc. and virtual library resources for students and staff of 5 departments using both desktops, mobiles and laptops with authentication system like user name and password. The same can also be used to extend facility for biometric attendance machines and C.C Cameras in the campus. REQIUREMENTS: Govt. Polytechnics for two branches.